VARIUSCARD is your contact for IC cards, contactless NFC / RFID smart cards, hybrid cards. Best advice, fast delivery, low prices and smart card system solutions complete our product range. We are looking forward to your inquiry! Chip cards, called smart cards are used for E-cards, ID-cards, customer-loyalty-card or citycards furthermore it can be equipped by a payment function. In comparison to the magnetic stripes and the barcodes it offers a bigger flexibility because of the high storage volume. Therefore these cards are suitable as memory cards for data or as security-key for access and time attendance systems. Chip cards can be used for different platforms and also can be integrated in existing systems. Processor-chips show a special form: They are working with their own operating systems and they are used for reliable applications, especially in the payment transctions. Beside these chip types, which are working by a card reader, VARIUSCARD also offers RFID und NFC chips. These cards are working contactless. Which requirements you wanna have on your chip-cards: VARIUSCARD is your competent partner for every usual chip card and chipcard completesystem. 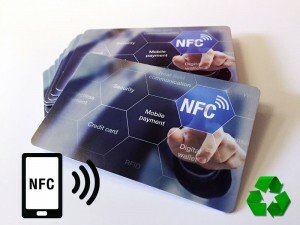 The Near Fiel Communication-NFC is an international transmission standard for contactless exchange of data via radio technology of short distances like few centimeters. So far, this technical is used for micropayment- cashless payment smaller amounts- but it can also be used for customer or membership cards. Contactless technology (RFID or NFC) is used wherever persons or objects are to be identified without direct contact or data are to be checked. 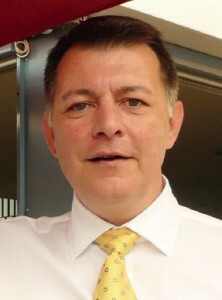 Such data carriers are based on transponders, a combination of chip and antenna, and enable the reading, storing and sending of information via radio. A distinction is made between low-frequency, high-frequency and ultra-high-frequency transponders. RFID media are impervious to moisture, soiling and mechanical influences. As a result, a virtually wear-free use of the map information is possible. By segmenting, various applications (e.g., access controls and canteen systems) can also be accommodated on a smartcard. In addition to NXP, ST Micro-Electronics and Infineon, our partners include many other suppliers and partners with whom we work together. We are happy to help you with questions about smart cards. Call us or send us an email.